Thank you for your interest in the Beth Israel Deaconess Medical Center Harvard Psychiatry Residency Training Program. This fall, we will begin accepting applications for PGY 1 residency positions that begin in June 2019. Please submit applications to us through ERAS and include at least three letters of recommendation submitted on your behalf. One of these letters should be from a psychiatrist who is familiar with your work. Additionally, at least one letter should be from a rotation that involved direct care of patients as part of a primary treatment team (internal medicine is preferred, but others including family medicine, surgery, or pediatrics are acceptable). In addition, please be sure to send us a personal statement and your USMLE transcript. We ask that all materials reach us by November 1, 2018. 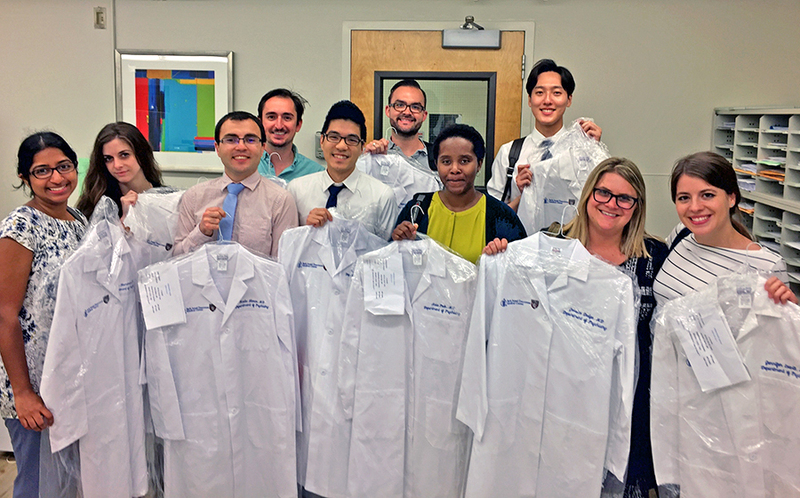 The class of 2021 trying on their new white coats! We will review your application, dean’s letter, transcript, and supporting materials when we receive them through ERAS. Starting in September, we will contact selected applicants and invite them to visit the program and meet with a number of our residents and faculty members. We plan to schedule most of these interviews in November and December 2018, and January 2019. We will choose our residents through the National Resident Matching Program and will review the specifics of this process during your visit. If you plan to apply to this program, it is essential that you register with the NRMP and comply with its requirements and deadlines.Because the Massachusetts Board of Registration in Medicine now requires a passing score on USMLE Steps 1 and 2 for both limited and full licenses, we strongly encourage applicants to take USMLE Step 2 and submit evidence of completion prior to February 1, 2018. We sponsor J1 and, in unusual circumstances, H1B visas. Clinical rotation experience (beyond observership) in the United States is required, as well as solid passing scores on exams. Contact the ECFMG to apply through ERAS. Please feel free to contact any of the training directors or our training coordinator (see contact information below) with any questions.